1066 was a record-breaking year of amazing feats. In England, Harold mobilized the local militia, known as the fyrd, throughout the southeastern coast in anticipation of William’s visit. He kept the fyrds mobilized for over four months something which had never been done before and speaks to Harold’s administrative qualities. Across the channel, William was also showing his abilities in assembling and maintaining an army of vassals, allies, and mercenaries. The winds were against him throughout the summer when campaigning would have been ideal. Keeping that motley horde under control through those longs weeks of peace was a feat in itself. During these idle months of waiting, he was able to secure papal support through adroit politic maneuvers. With papal support, William’s cause suddenly took on a holy crusade-like air that brought in more allies but more importantly made the whole endeavor more legitimate. The stage was set for these two titans to fight it out but the winds that kept William in Normandy sent a dark horse contender to England’s northern shores. Literally out of the blue and sailing on the thinnest of claims to the English throne came King Harald Hardrada of Norway along with thousands of lusty plunder-seeking Norse adventurers. They came in longboats much like their heathen Viking ancestors of previous centuries did when they came to raid England. At this point, history students might shake their heads in disbelief. 1066 was all about Harold and William: Anglo-Saxons and Normans, right? What the hell were Vikings doing in 1066? No doubt Harold was wondering the same thing as he scrambled to deal with this unforeseen threat. Thus began a dramatic episode that is often left out in the briefer accounts of 1066. - Snorri Sturlasson, Heimkringla (“The Saga of Hardrada”), 13th Century. Harald Hardrada was a legend in his own time. He could rightly be considered the last of the Vikings although he was Christian at least in name but not practice. He fought battles from the Eastern Mediterranean world to Scandinavia and ended his career fighting in England. Hardrada fought in his first battle when he was only 15. He found himself on the losing side and wounded. He left Norway and took service with the Byzantine Empire. The Byzantines had been impressed with the courage and hardiness of Hardrada’s people for years having been attacked by them in the past. They formed an elite troop known as the Varangian Guard composed solely of Norsemen. Hardrada quickly gained their respect and went on to fight numerous battles for the Byzantines. Hardrada employed various strategies cunning and cruel to win his battles. He used birds set on fire to burn out one town and faked his own death to gain access to another one. He eventually fell out with the Byzantines and was imprisoned but in another of his daring exploits he escaped. Hardrada returned to Norway laden with booty and fame. He shared the throne with his half-nephew and when that nephew conveniently died, Hardrada assumed the whole country. He waged a futile destructive war with Denmark for 15 years before finally concluding a truce. Hardrada and his men had been at peace for two years itching for action when blessed opportunity for war came sailing their way in the form of the English king’s embittered brother, Tostig. For Hardrada and many that followed him to England, it would be their last journey. 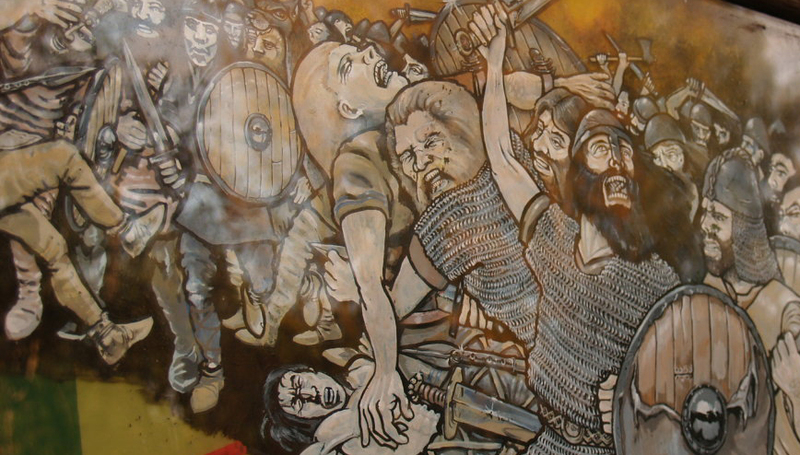 Hardrada was clever, lucky, and resourceful but he was also cruel, dishonest, and greedy even by Viking standards. He fought mainly for the love of battle. He was a tall man for the times. At the brief negotiation session before the Battle of Stamford Bridge, King Harold Godwinson offered Hardrada “seven feet of English ground, or as much more as he may be taller than other men.” King Harold, however, permitted the surviving Norsemen to take Hardrada’s body back to Norway for proper burial. What brought Hardrada to England’s shore in the first place is another bit of the year’s complexity — Harold’s embittered estranged brother, Tostig. A favorite of the old king and former Earl of Northumbria in Northern England, Tostig was a minor player in the scheme of things yet his actions had serious impact on the upcoming Battle of Hastings. Tostig hated his brother because he believed Harold had betrayed him. A year earlier, Tostig’s subjects rebelled against him. Although the old king was willing to ravage the area for Tostig’s sake, Harold made peace with the rebels for the good of the realm. Tostig never forgave him. In May of 1066, Tostig set off the chain of events leading to the Battle of Hastings by attacking southern England with 60 ships. They were minor affairs but it made Harold call out the fyrd earlier than he would have. He thought William would soon follow in force but in actuality William was still making preparations. Keeping the fyrd mobilized for four months eventually taxed Harold’s resources and he disbanded it in early September, less than two weeks before Hardrada’s army landed. Tostig had been chased off but the hatred of his brother drove him on so off he went to the court of the great Harald Hardrada. He promised the king support of the English nobles. He was bluffing but Hardrada was seriously out-of-touch with current events and it might have been that he wouldn’t have cared anyway. Hardrada was fifty at the time so his gambit might have been one last great jaunt before retirement. Hardrada’s thin claim rested with a promise from one of the earlier Danish Kings of England some decades ago that had been made to Hardrada’s predecessor. Again, the whole affair smacks more of daring-do and just for the hell of it rather than a righteous struggle for the throne. In yet another of the amazing feats of the year, Hardrada raised an impressive force of thousands of warriors in short time and sailed a large fleet reportedly of 300 ships to the British Isles. There he burned the town of Scarborough in northern England to the ground mainly just for the fun of it. Then on September 20, Hardrada completely smashed an English army at the Battle of Fulford near the city of York. His victory, however, would later prove his undoing. The Battle of Fulford was the first of the three great battles of 1066 and the least known. The main source comes from the Viking side. What makes this battle of dramatic interest is that it was probably the most personal. The leaders of the English were the earls Edwin and Morcar. It was they who had rebelled against Tostig a year ago and killed a number of his followers. Morcar was named earl in Tostig's place. The hatred between Tostig and these two men must have been great. Morcar's anger seemed to carry him further because he pushed Tostig's forces back with much slaughter. It would have been an English victory but crafty Hardrada drove off the forces in front of him then swung around into Morcar's force and crushed them. The city of York submitted and its leaders promised to meet him with 500 hostages at nearby Stamford Bridge five days later. Hardrada was pleased as he could be. He had had a great time of it burning, looting, and fighting. With Edwin and Morcar's army ravaged, the northern area was defenseless and Harold was far south. It seemed now a simple matter to hole up in York and fight Harold for the crown — but at a later time. Now was a time for feasting and celebrating. The morning of the 25th probably found a number of Norse soldiers at Stamford Bridge more than a little hung-over. Many of them were unarmored since they were only going as a show of force. Soon their bloodshot eyes spied in the distance the dust kicked up by the approaching hostages. It was an awful lot of dust. Weren’t hostages supposed to be unarmed? Suddenly it dawned on them that what was approaching was a heavily-armed hostile army! In complete disbelief, the Norsemen watched in mounting horror and growing sobriety as an army led by King Harold Godwinson, who should have still been far south mustering troops, came bearing right down on top of them. It was going to be a long day. - Snorri Sturlasson, Heimkringla (“Saga of Hardrada”), 13th Century. Another record had been broken that year in 1066. If Hardrada had surprised Harold, Harold more than returned the favor by defying military logistics of the day in marching an army from London to York, a distance of 190 miles, in just four days – a thing unheard of at that time. On the evening of the 24th, the surprised citizens of York greeted him as a liberating hero. This was Harold’s finest hour. On the next morning he rode out to fight a living legend. The Battle of Stamford Bridge has been called by some medieval scholars the last great battle of the Dark Ages. It was long, brutal, and bloody. Both sides fought mostly on foot and hacked at each other with axes and swords just as their ancestors had done for centuries since the time of Beowulf. One incident at the Battle of Stamford Bridge that was remembered by English writers of the Anglo-Saxon Chronicles was the defense of the bridge at Stamford by a lone berserker warrior. This lone warrior who more than likely did not wear a horned helmet stood off the approaching English army allowing his brethren time to set up their ranks. It’s debatable whether the incident really happened or not but it’s true to the nature of the Norsemen. Although the Norsemen were taken by surprise and many of them were without armor, they fought hard and killed many of Harold’s men before they themselves fell. Hardrada, the veteran of countless battles since he was 15, died a Viking death in battle; his throat pierced by an arrow. Reinforcements from the Norse fleet eventually arrived but many were so exhausted from the effort of getting there that they collapsed. The English pushed the remaining Norsemen back to their fleet. Against Harold’s wishes, Tostig was killed during the latter part of the battle. The Battle of Stamford Bridge raged from morning till night. By the end the Norsemen were utterly defeated and the few survivors sued for peace. Harold granted them safe passage and they sailed away on only 24 ships out of the original 300. Although they didn't realize it at the time, the English had effectively ended the Viking threat once and for all. No more would great raiding fleets come from out of the north to plunder and ravage. Harold had lost a brother but he had gained a great victory which if hadn’t been for that “other” battle would probably still be praised to this today. He spent a week in York probably convinced William would not set out until next spring if his army had not fallen apart before then. Amidst a victory feast in the days that followed the battle, a breathless messenger arrived at the king’s table. The news that Harold had dreaded to hear ever since he took the crown had at last arrived — William had finally come to England. 1066 And All That Redux Part III - Winner Takes All, Mon Ami!